If we think of invisibility this way (and not the more literal spooky H.G. Wells way) then I suppose that Kerner is an Invisible Wine. Kerner is a hybrid wine grape – a cross between noble Riesling and very humble Schiava Grossa, also known as Trollinger in Germany and Vernatsch in its native Alto Adige region of Italy, where it mainly produces inexpensive everyday red wines for local consumption. Kerner is a relatively recent invention, first bred in 1969 according to the Oxford Companion to Wine, and named for Justinius Kerner, a 19th century poet and song-writer with a particular affinity for wine. Hybrid grapes have the same reputation as movie sequels. They are frequently profitable and sometimes very enjoyable, but never as good as the original. There are exceptions to this rule (both for grapes and for films) but in general the stereotype holds. Kerner is often viewed as a Riesling sequel, having many of the qualities of Riesling, but with higher yields and better frost resistance. Critic reactions to Kerner are mixed. Jancis Robinson, like me a big Riesling fan, writes that “The large white berries produce wines commendably close to Riesling in flavour except with their own leafy aroma and slight coarser texture.” She calls it a “great success story.” Oz Clarke is less enthusiastic, writing that “It is one of the better modern crossings … which perhaps is not saying a great deal.” You see what I mean about stereotypes. There are about 3700 hectares of Kerner in Germany, far behind Riesling (22,000 hectares), Muller Thurgau (13,000 hectares) and Sylvaner (5000) among white grape varieties but still a considerable amount. While varietal Kerner wines are made in Germany (some quite good, according to Robinson), I suspect most of the grapes are destined for “invisible” inclusion in various blends, which is what happens to hybrids. The story is quite different in Alto Adige, that part of Italy that was Austrian before the First World War and exists today as a semi-autonomous region with both German and Italian (as well as Ladin) as official languages. This is the home of Kerner’s parent, Schiava/Vernatsch, and Kerner is embraced here for what it is, not as a Riesling sequel or substitute. The Valle Isarco (or Eisachtaler in German), which follows the Isarco river up into the Alps, is the main Kerner region and here, freed of stereotypes, it achieves something quite special. 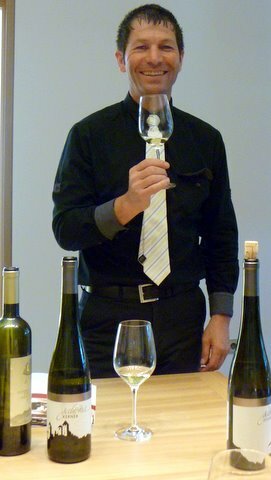 We were fortunate to have a private tasting of the wines of the Cantina Porduttori Valle Isarco (a.k.a Eisacktaler Kellerei) in Chiusa. Peter Baumgartner, a local banker who is the cooperative winery’s president, explained the winery’s business side (look for an upcoming post on cooperatives in this region) and guided us as we tasted the wines. Cantina Valle Isarco specializes in white wines (Baumgartner plans to phase out the remaining reds in the portfolio): Sylvaner, Muller Thurgau, Veltliner, Traminer Aromatico, Pinot Grigio, Pinot Bianco, Chardonnay, Sauvignon, Riesling and of course Kerner. Production is about 1 million bottles a year and the market is mainly local: 50% in Alto Adige, 40% in other parts of Italy with most of the remaining 10% exported to Germany and Switzerland. Wines are produced to hit several price points starting about about €6 for the entry level and moving up from there. The Cantina makes four Kerner wines starting with the entry level wine (which we did not taste) and moving up through the premium Artisos series, a limited edition Sabiona Kerner (made from grapes from the Sabiona Monastery vineyards) and ending with a deliciously sweet Kerner Nectaris Passito made from late-harvest grapes left to dry and concentrate their flavors on straw mats in the manner of Amarone. I once heard the sports philosopher Charles Barkley say that a particular basketball player was successful because “he plays like himself” instead of trying to be someone else. I think the Kerner wines made by the Cantina Valle Isarco are interesting (and apparently successful, too) because they “play like themselves” — they seem to be made to be themselves and not an imitation, substitute or sequel for something else. In fact, they are among the very best white wines of Italy. Or at least that’s what the editors of the Gambero Rosso guide seem to think. My 2007 Vini d’Italia guide lists three Kerner wines (from Cantina Valle Isarco, Manfred Nössing-Hoandlhof and Abbazia di Novacella) among the 282 wines from all of Italy receiving the highest “three glasses” (tre bichierri) award. That’s a disproportionate achievement for an invisible wine from a tiny Alto Adige valley. Kerner shows that local wines can excel if local markets embrace them and that even invisible wines can sometimes shine in the spotlight if they follow Charles Barkley’s sage advice. Cooperatives have a bad reputation in the wine business. Some of the worst wines in the world are made by cooperatives that favor quantity over quality. But, as we have seen here, some of the best wines are also made by cooperatives. High quality cooperatives are unusually prominent in Alto Adige. Why? How? These are questions I’ll try to answer in my next post. Thanks to Peter Baumgartner for his generous hospitality during our visit to Cantina Valle Isarco and also at the opening reception of the AAWE meetings in Bolzano. Looking forward to your views on the economics of the co-operatives and the co-operative model. It should be (but is not) a big issue of debate in many regions in France and Italy. Perhaps it (the prominence of co-operatives in those countries) is one of the reasons why new world wineries are more successful in some market sectors than some old world countries? Interesting article sir. Just like a child who doesn’t necessarily need to follow the footsteps of his dad, Kerner also doesn’t need to be seen as just a mere replica of its parent wines. It has its own distinct features and characteristics to boast of.